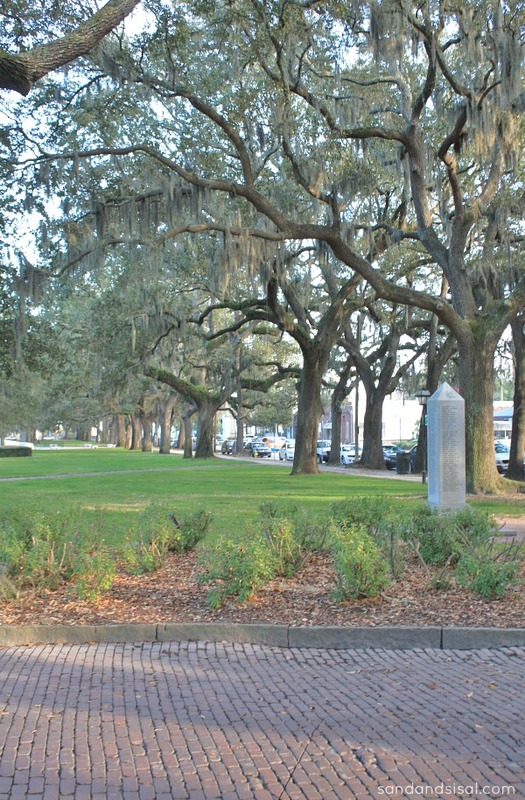 On my recent blogger retreat to Tybee Island, we headed back to the mainland for a visit to Savannah. 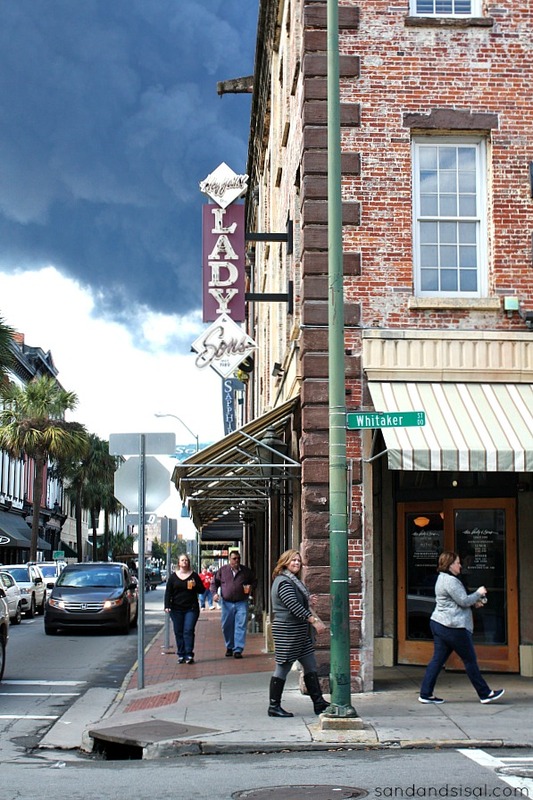 I had never been to Savannah before and was excited to see the city. 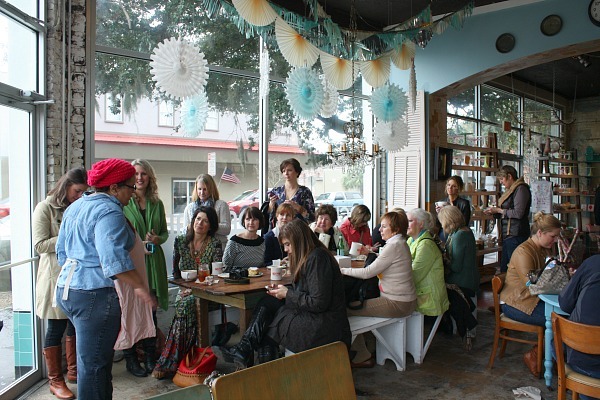 We started the morning at Back in the Day Bakery, an amazing restaurant with delicious food and whimsical, vintage decor. 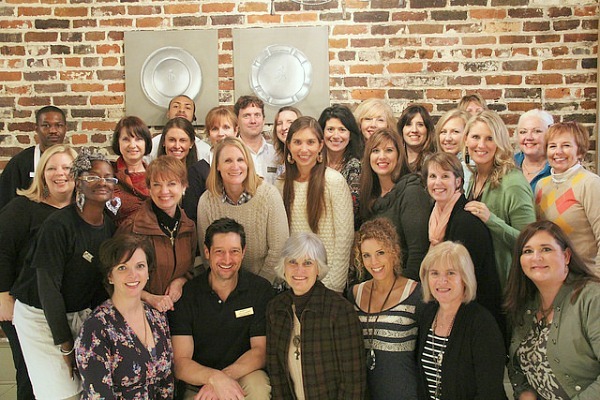 The owners, Cheryl & Griff, welcomed our group with gracious southern hospitality to the bakery and shared a bit about the history of their business. 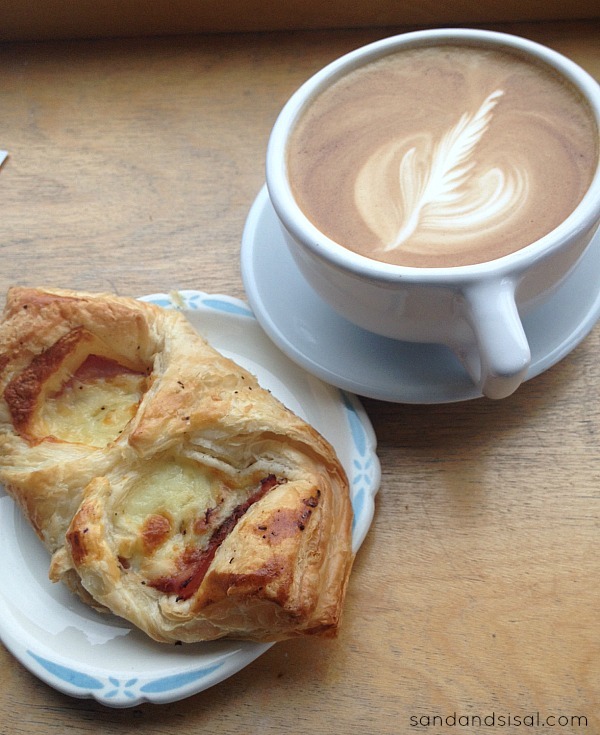 I ordered a scrumptious ham and cheddar bakery croissant, which was light and flaky but satisfying. The pastry had a surprising hint of spicy heat which I loved! My high light was sipping on a latte that was almost too pretty to drink. One word to describe the bakery: DELISH. 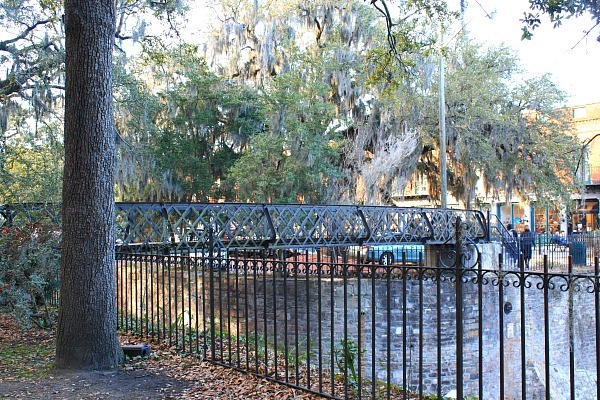 If you are in Savannah, make sure to visit Back in the Day Bakery. It was a definite local hot spot. I kinda felt bad that our large and very paparazzi-like gathering invaded the locals’ Saturday morning, but they didn’t seem too phased, in true laid back southern acceptance. 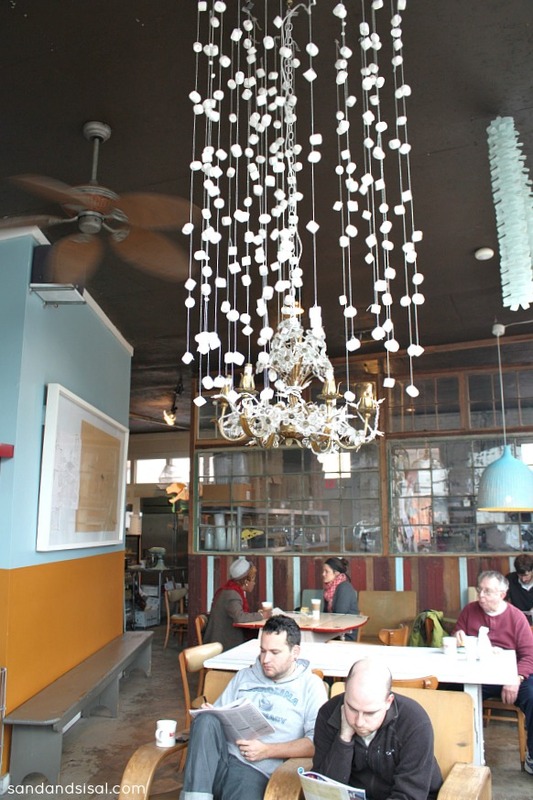 Everything about the bakery will bring a smile to your face, whether it is the delightful staff, the food, the vintage gift shop items, or the fun decor like this marshmallow chandelier! How cool is that!? After filling our tummies we were ready to do a bit of sight seeing and shopping. 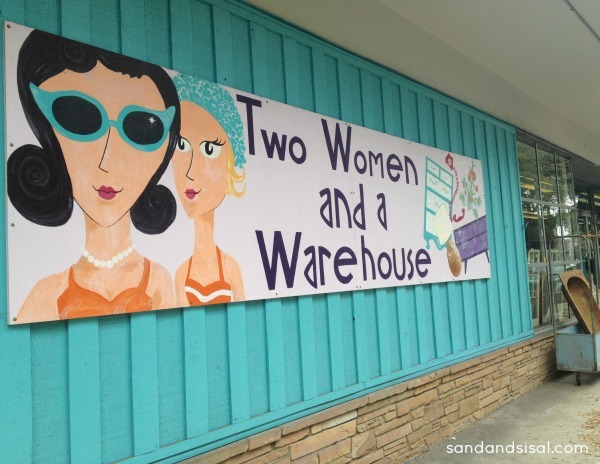 First stop was a wonderful consignment store called Two Women and a Warehouse. 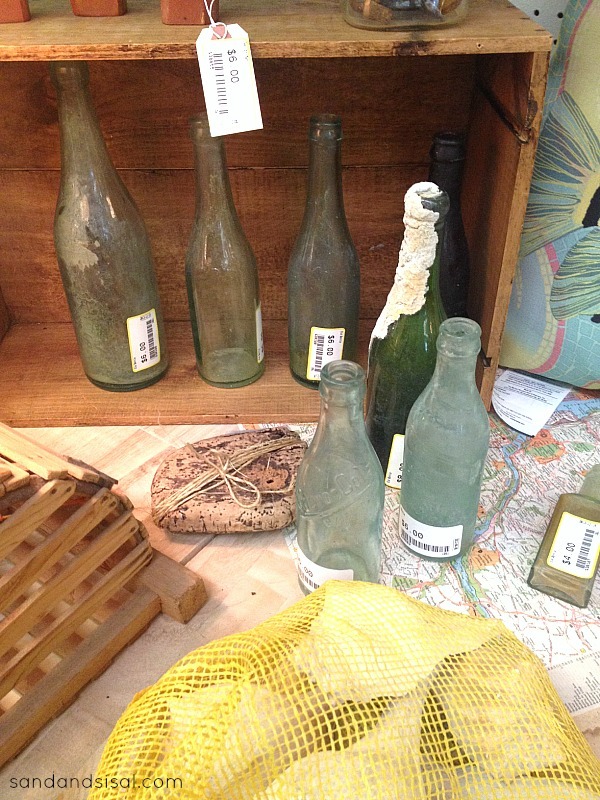 I found a few vintage bottles that looked as if they had been found somewhere along the seashore. One even had tiny barnacles in it. We strolled through a few other antique markets and when were leaving we heard sirens and noticed an enormous and ominous black pillar of smoke. A very large tire warehouse had just caught fire. It was quite the spectacle and talk of the city all afternoon. 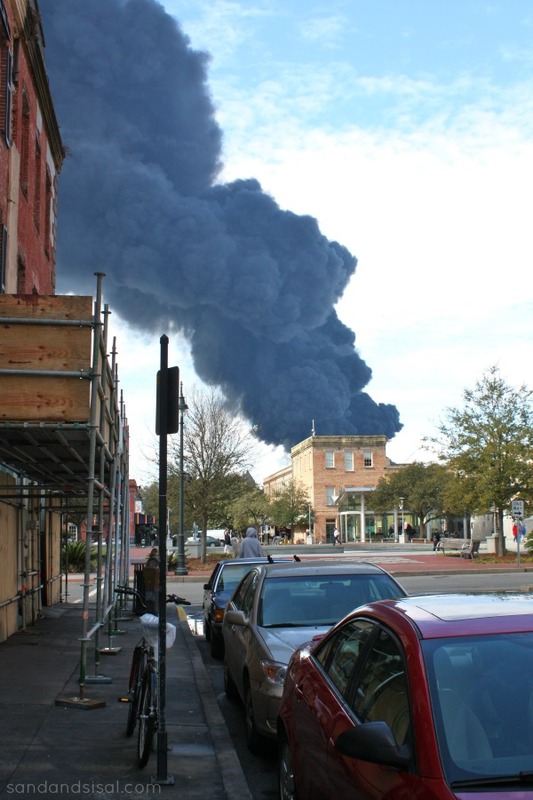 A beautiful, turquoise blue haired, art student from SCAD (the prestigious school of art & design) saw me gazing in awe at the massive plume and shared her Instagram photos with me of the scene, close up (which are way more shocking than my photos). She was very concerned because she knew that SCAD had student housing in close proximity to the fire. They had told students to turn off all heat and close any windows due to the toxic smoke. 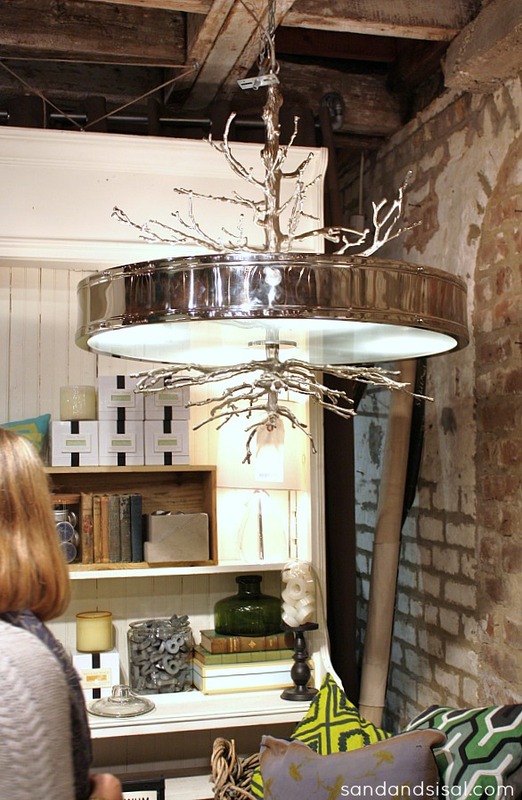 Note to self: visit SCAD next time in town. A morning full of shopping makes a girl hungry! We had a private room reserved for all of us at Paula Deen’s restaurant, Lady & Sons. Eating here has been on my bucket list. I LOVE Paula. Watching her cooking shows always made me happy. I totally believe Butter Makes Everything Better. 😉 At least for the short term. 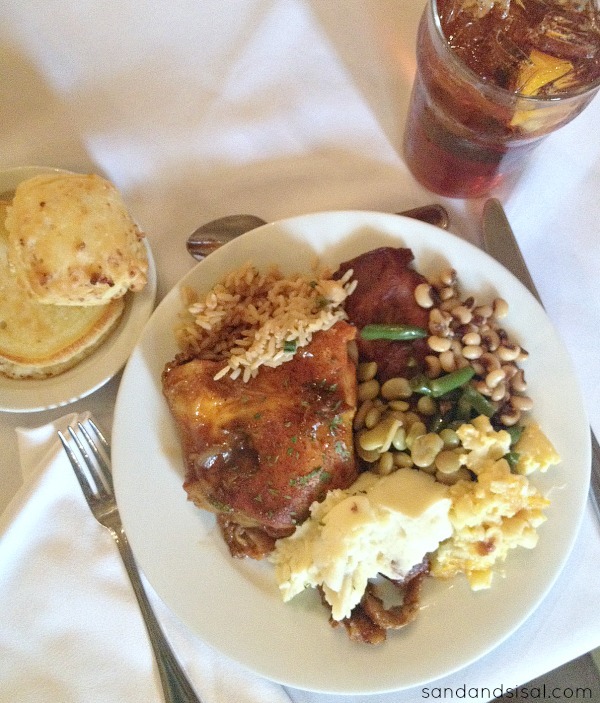 We all dined on a buffet of southern dishes. I had to sample a bit of everything! And in case you were wondering… Paula’s sweet tea is SWEET with a capital “S”! 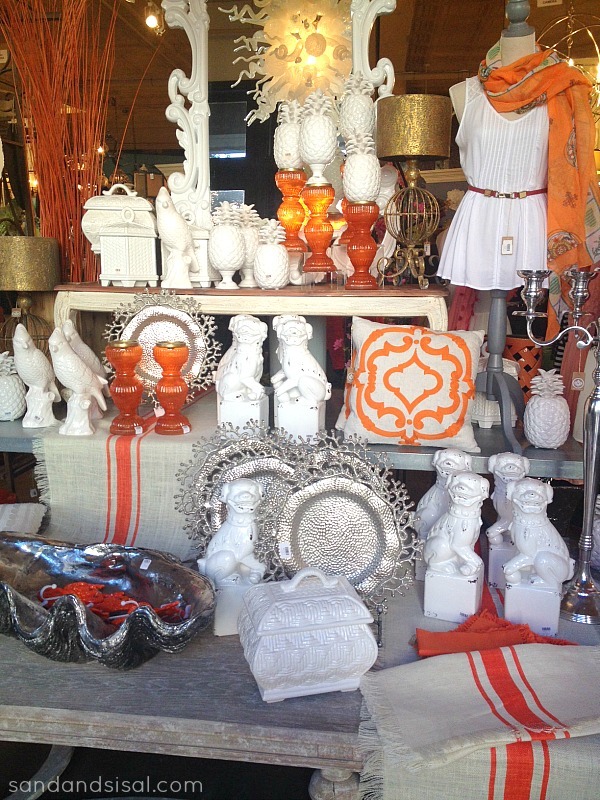 The lovely Claudia Deen, Paula’s daughter in law, spoke to us about her blog, Chicaloverde. We took a group shot together with the Lady & Sons staff. They were wonderful. Claudia is the long haired brunette in the center. After stuffing ourselves to our gills, we rolled out onto the street for more shopping. 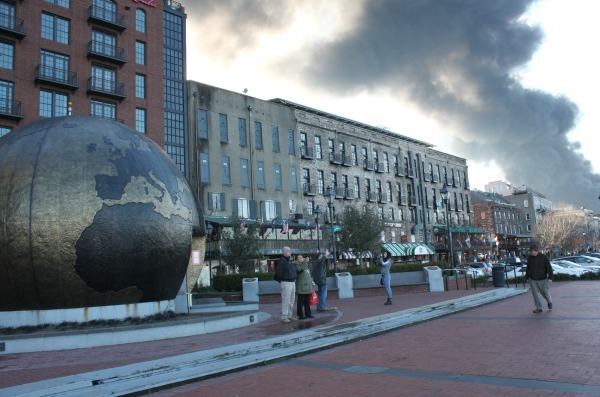 This area of town by the restaurant is a bustling collection of wonderful shops and restaurants. I had been told that when in Savannah, The Paris Market was a must see store. The store has two levels of the most unique items. 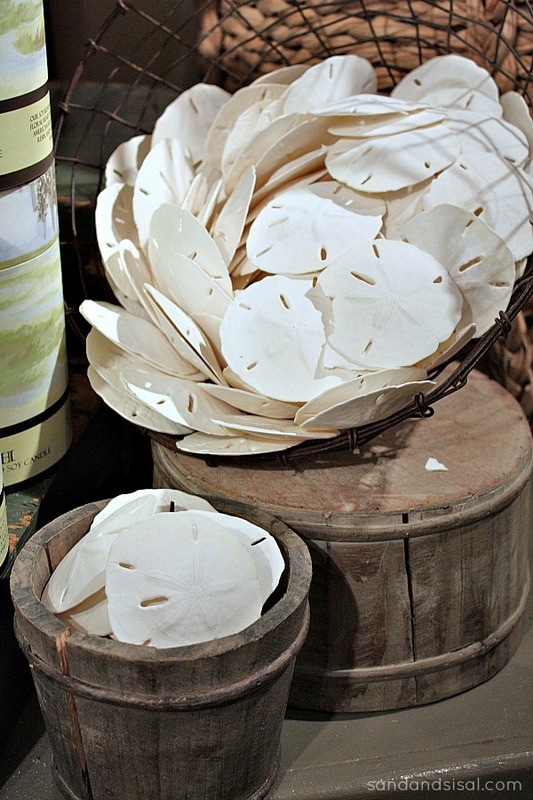 It also has quite a bit of coastal decor. Can you just see me smiling? 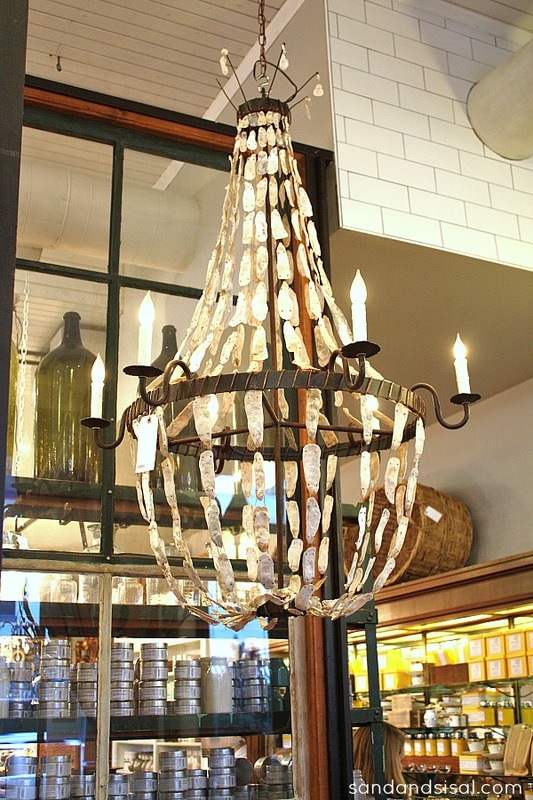 Just look at this stunning oyster shell chandelier! Shopping was frustrating I must admit. Because I flew down to Savannah, I didn’t have room to bring anything home with me on the plane. Booo! Can you tell that I kind of had a thing for chandeliers on this trip? How could I not? Everywhere I turned, the most creative and unique chandeliers were screaming “take me home with you”! 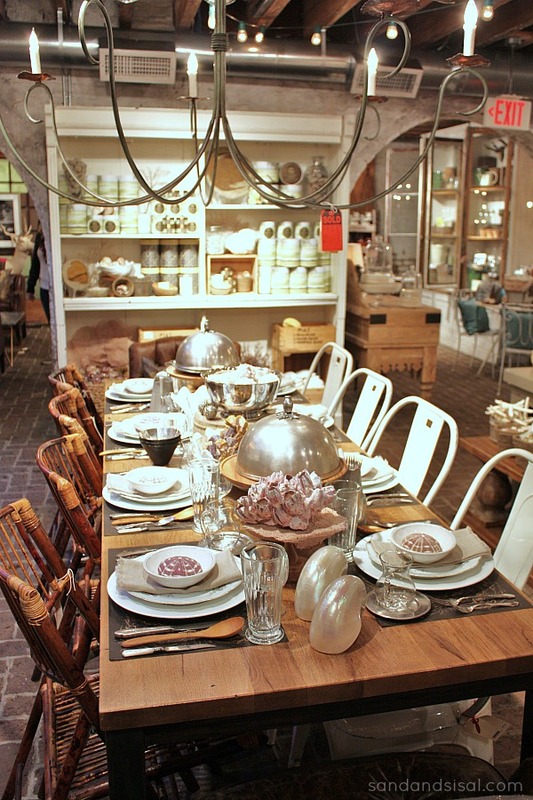 A-hem… speaking of chandeliers… oh my gorgeousness! 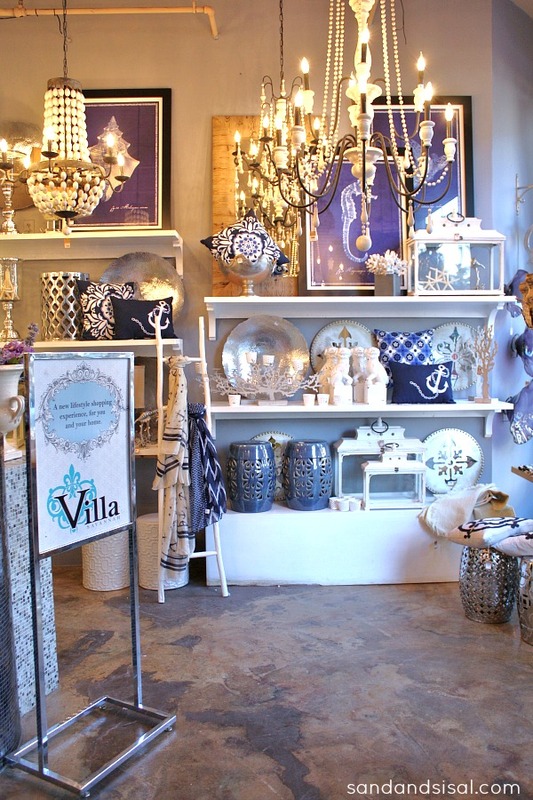 We entered, I must admit, my absolute favorite store of the day, Villa Savannah. 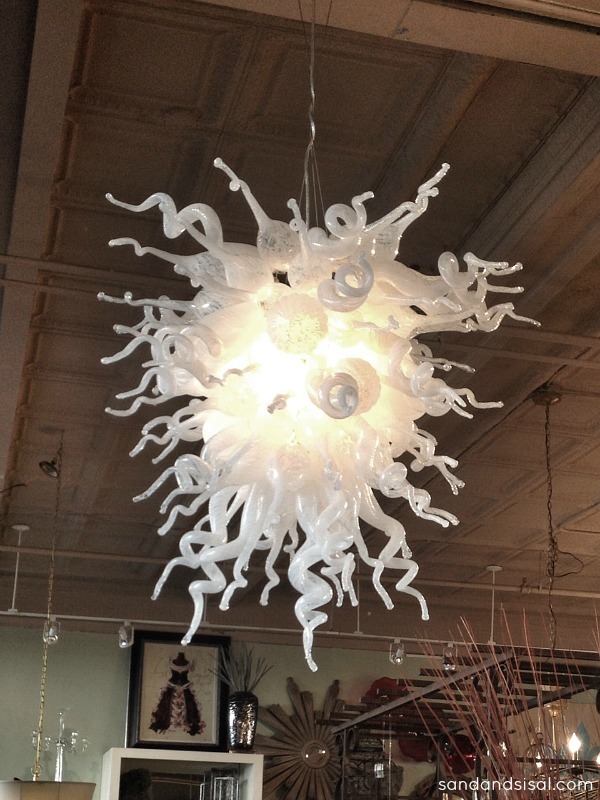 The blown glass chandelier is a work of art! Stunning! I could have spent hours shopping in Villa. 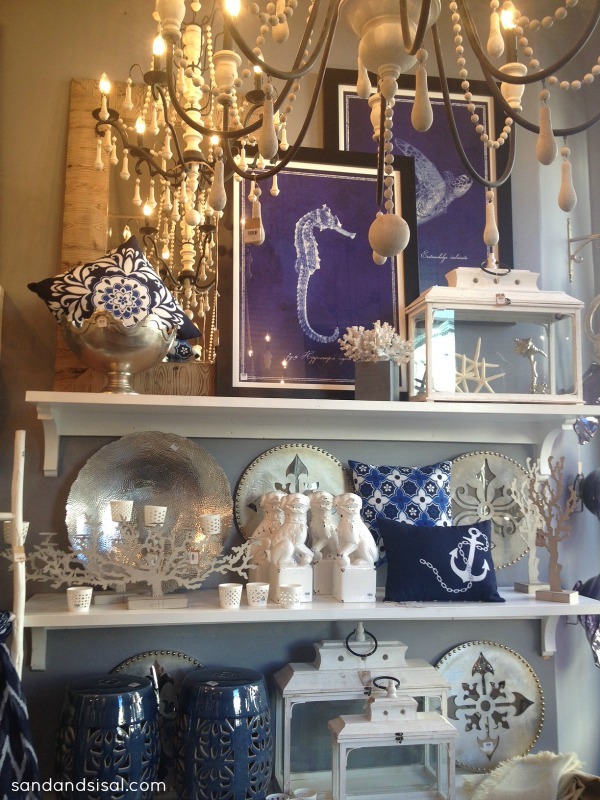 It is loaded with coastal decor and beautiful clothing. I’m hoping they will take some phone orders because I had my eye on a gazillion items! The afternoon was quickly escaping us and sunlight was fading. I hadn’t even seen any of the historic squares yet. We quickly left the stores and strolled the brick and cobble stone streets. The architecture in Savannah is breathtaking. I wish I could have seen more. 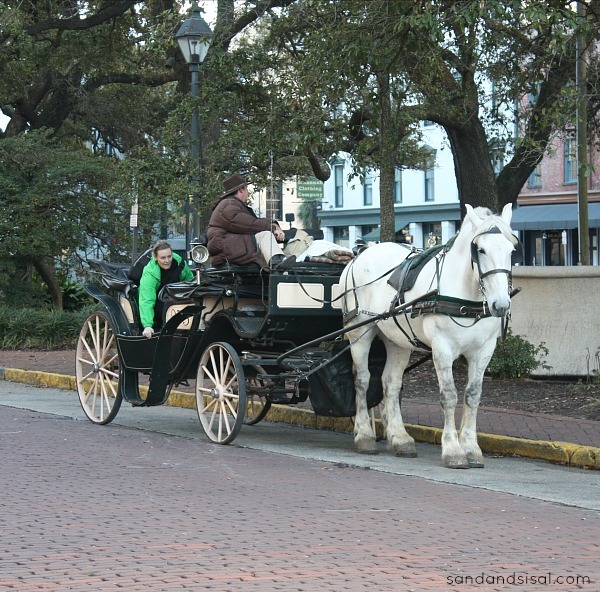 Plenty of horse and carriages were available for touring the historic district. 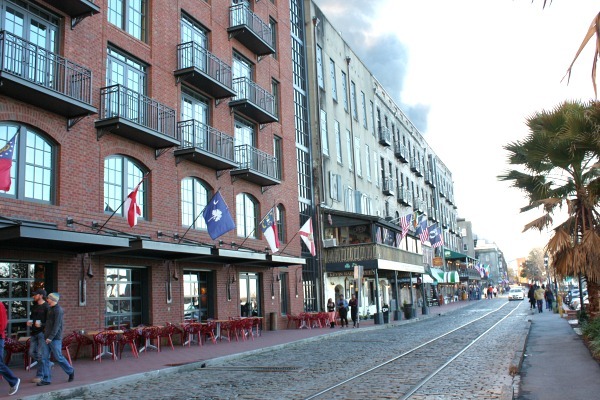 We made our way down to the riverfront and watched the ferry boats glide by… and that fire that kept growing! Scary. 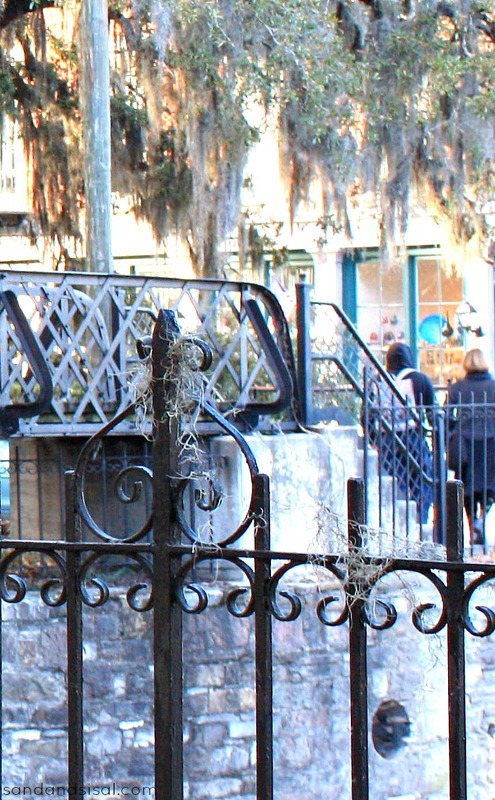 I loved all the ornate iron work seen all over Savannah. But the moss, oh the moss! 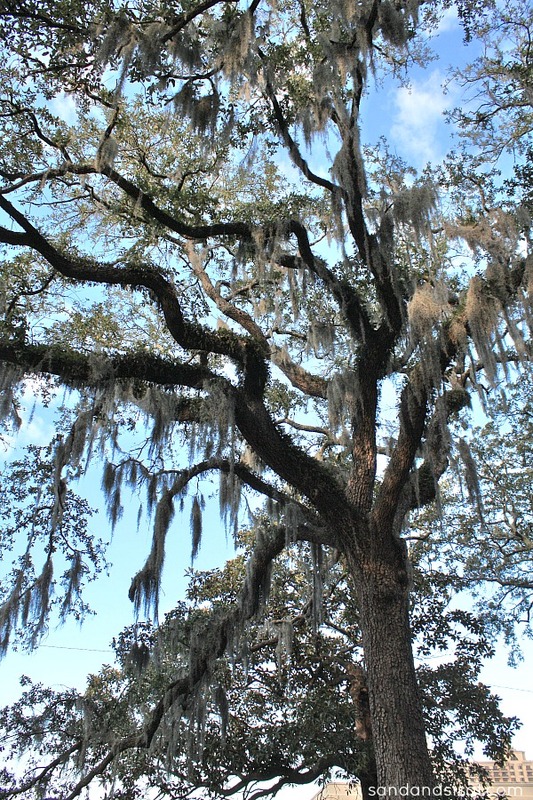 Spanish moss drips off the towering live oaks. Words escape me, it is just so beautiful. The day came to a close too quickly and we had to return back to Tybee. 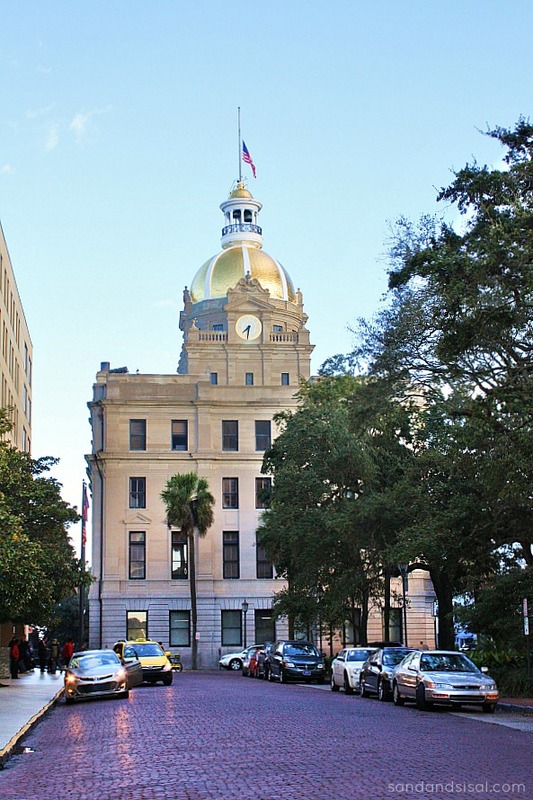 I know that someday I will have to bring hubs back to this gorgeous and historic city and take our time soaking in all the splendor the Savannah has to offer. I will have to check out Villa Savannah. 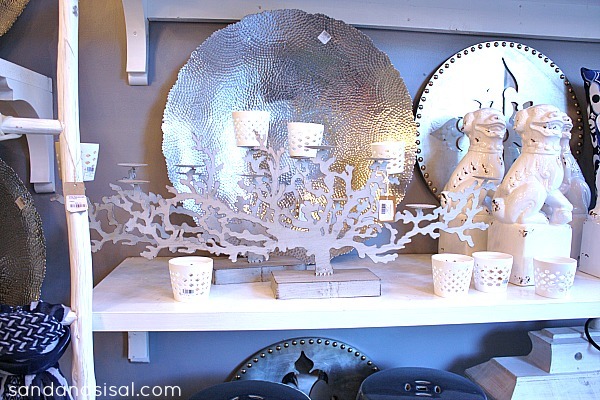 Next time you go, try to go to One Fish, Two Fish, another coastal decor store that I believe has been featured in Coastal Living magazine. You would like it, I believe. Kim, I wish we had had more time in Savannah to explore. I loved reliving it through your gorgeous pictures though… you caught things in your pictures that I didn’t even notice! A weekend is not enough time to enjoy our beautiful city. We also had our annual “Springtime in the South” arts & crafts show going on across the river at the convention center, (next to the Westin) all weekend too. Haha! Oh wow! Sorry I didn’t get to meet you at the bakery. That food was so delish. You are a very lucky lady to live in such a beautiful city! Kim, my daughter and I had the chance to go to Savannah a few years ago and like you am hoping to get back one day with the other half. Such a wonderful city to visit. Loved looking at your photos and remembering our trip. Glad you had a good time except for the fire of course. I am so excited to see these pics of Villa Savannah. I am looking forward to sharing your experience with the staff tomorrow. We are so thankful you stopped in. We heart Sand and Sisal! xoxo- the team at VILLA SAVANNAH!